There is a dedicated web site for the service (www.shop.coop.co.uk) and goods will be delivered within two hours. The store is located on the Kings Road and the Co-op said the fast delivery time was due to the electrically assisted cargo bike’s ability to use cycle lanes, filter safely through standing traffic, pass between the narrow bollards adorning many of our streets, and park outside customers’ homes and offices to make deliveries. 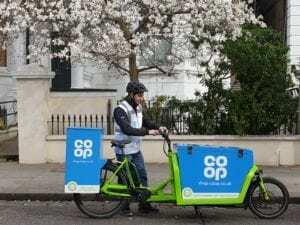 If this service is successful, the Co-op plans to roll it out to other stores in London.